I’d imagine that, at this point in time, half of the universe has played a Breakout-styled game of some sort. Various iterations of the popular genre have been and gone, some masterfully implementing unique spins on the well-worn formula whilst others have stuck true to the core mechanics that made the original such an important game in the first place. Glaive: Brick Breaker doesn’t sit in either camp; it merely just exists, content in what it achieves and never truly strives to be something great. The core mechanic – for those not initiated in the way of the paddle – is to break the bricks at the top of the screen by firing, then deflecting, a ball with a controllable paddle. This paddle usually interacts with the ball in a way that would make the most sense physically but Blue Sunset Games have instead decided to mix this up – whether intentional or not – to deflect in the direction corresponding to the side of the paddle it lands on. This, not only for players of previous Breakout-inspired titles but instead for other players too, leads to a disconnect between the paddle and the ball. When taking that this is essentially the most important aspect of Glaive, this is worrying indeed. 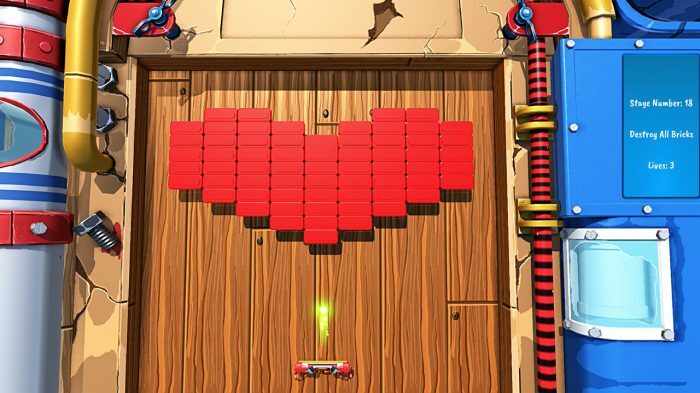 What the game can offer you is a large number of levels – 125, to be exact – for you to smash through. Each level features a varying layout of different coloured bricks, some requiring multiple hits to break, but all feature the same wooden backdrop and rotating music selection. Whilst the theme was endearing to begin with, by level 12 it had severely outstayed its welcome and left the experience feeling stale. Furthermore, with no option to change the overall aesthetic of each level alongside the slower-than-expected speed of the balls, the high-octane music that featured immediately felt at odds with the rest of the game. Techno remixes of unlicensed music tracks featured heavily throughout my time with Glaive: Brick Breaker and did very little to add to the experience as a whole. With other breakout-inspired games, such as 2009’s Shatter, managing to expertly blend gameplay, aesthetic and sound design into one cohesive product, it truly brings Glaive’s disjointed nature to light. Comic Sans, is that you? 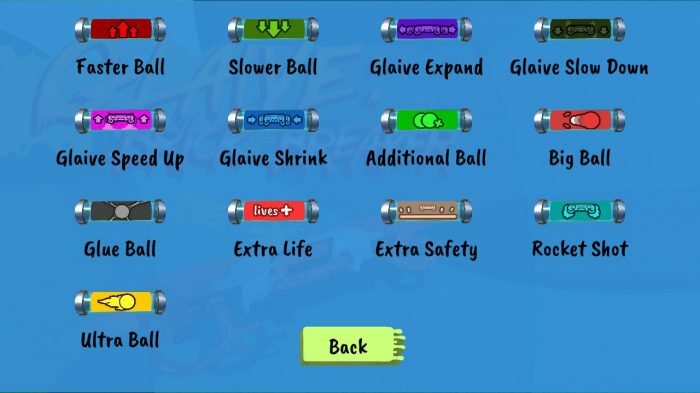 Various power-ups also have a chance to drop from broken bricks, too, and these can vary from enlarging/shrinking the paddle, making the ball from faster/slower, to firing a rocket. Whilst this does offer some variation from level to level, the frustration that it led to was my primary takeaway. It’s particularly difficult to work out what the power-ups are whilst they’re falling to the bottom, more-so due to the fact that the icons on these awkward additions are pretty much indistinguishable from one another, and not knowing whether this item you’re about to obtain will temporarily help or hinder you was somewhat of a nuisance, especially so as the game has attempted, albeit poorly, to make this clear to the player. 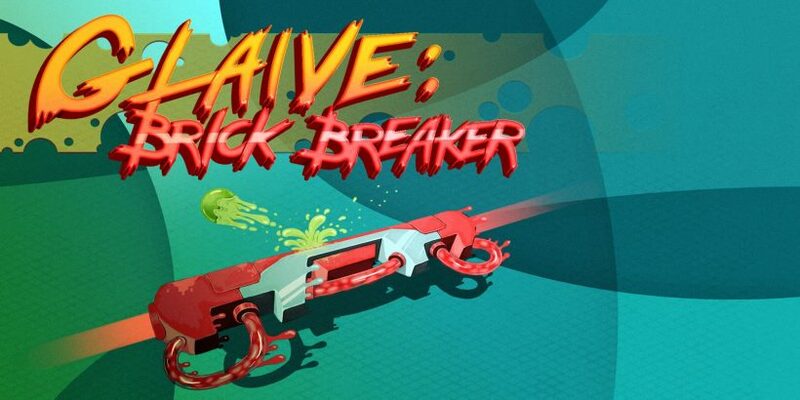 Glaive: Brick Breaker is, for all intents and purposes, a bland Breakout clone. It’s not that there was anything fundamentally wrong with the game – it was playable and occasionally almost enjoyable, after all – it’s just that there wasn’t anything right about it either. It merely exists, and at best may offer very brief moments of distraction while you think of something better to do with your time. Glaive: Brick Breaker appears to be a game that exists just to pay homage to its inspiration, Brick Breaker. It never tries to be much more than that, and is content wallowing in mediocrity.